Brain-computer interfaces are on the rise. Neural signal processing difficulties are what cause the loss of mobility in the limbs. Spinal cord injuries can cause these kinds of neural signal troubles, as can other issues such as muscular dystrophy, drug overdose, stroke, and neuropathy. In the case of spinal cord injuries, the brain sends a clear signal and the muscles in the limbs are capable of receiving them, but the damage to the spinal cord prevents the signals from getting through. The Center for Sensorimotor Neural Engineering (CSNE) — a collaborative effort between researchers from San Diego State University, the Massachusetts Institute of Technology (MIT), and the University of Washington (UW) — is developing an implantable brain chip to bypass the problem in the spinal cord. The chip records neural electrical signals and then sends them directly to receivers in the limbs, restoring movement. That’s already an impressive achievement, but recently the team published a study describing a critical improvement: a brain-computer interface (BCI) that could allow the chip to send stronger signals that would lead to longer lasting movement capability in the body. The BCI uses electrodes that read signals from neurotransmitters, recording and transmitting them to the appropriate limb or prosthetic device. Thin-film platinum has been the state-of-the-art material used for these electrodes, but this material carries a risk of fracturing and breaking down over time. The researchers from CSNE solved this problem by using glassy carbon to create the BCI’s electrodes. Glassy carbon lasts longer and resists corrosion more effectively than thin-film platinum and other metal used to make electrodes because it is about 10 times smoother. 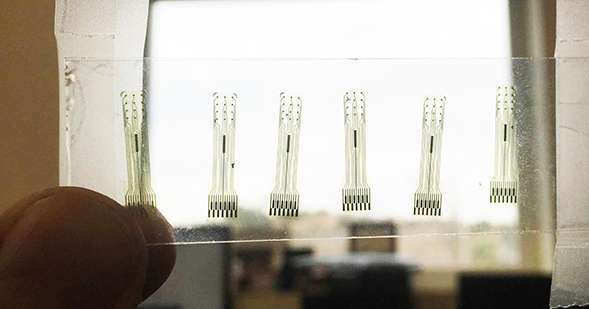 These, and other newer, more effective materials, are comprising BCIs in this lab and others, and the team, in this case, is using them to simultaneously record neural signals from inside the brain and along the cortical surface. Surface recording allows for signals to be received from clusters, whereas deeper recording allows the team to pick up signals even from single neurons. As a whole, this technique provides a more thorough understanding of the complexity of brain signaling. It may someday even be used to completely restore mobility and repair nervous system damage by stimulating neural growth from within the spinal cord. Additionally, there are many other teams working on newer, better models for BCIs. In January, a team of researchers reported using a BCI to communicate with complete locked-in syndrome patients. In March, Elon Musk provided more details about neural lace, which will blend humans with artificial intelligence. If Musk’s neural lace lives up to its promise, it will allow for mind-to-mind communication, direct mind-to-computer control, emotionally aware technology, and bionic limbs that feel biologically real, among other advancements. In April, former DARPA executive and current head of Facebook’s mysterious Building 8, Regina Dugan released new information about Facebook’s developing BCI with the goal of allowing mind-to-mind communication and ushering in a new era of social media. And in July, the US Department of Defense created and funded six consortia for developing BCIs. These are just a few of the more recent BCI developments, and more are coming; the BCI era is upon us.